EMeRG has raised more than $2,400 for a certificate course on mental health first aid. The group raised the funds through GW's Colonial Crowdfunding platform. Updated: April 4, 2016 at 10:30 p.m.
An EMeRG Colonial Crowdfunding project has surpassed its goal of raising $2,400 to certify 20 members as mental health first aid providers. This student-led effort comes after a yearslong focus on mental health on campus and would train EMeRG members on properly responding to mental health crises. The funds will go toward a mental health first aid course operated by the National Council for Behavioral Health, according to the crowdfunding page. The certification provides an in-depth lesson on treating individuals with mental health problems or helping those experiencing a mental health crisis. EMeRG is one of four student organizations raising money through GW’s crowdfunding platform this spring. EMeRG plans to offer the certifications for all crew chiefs, the primary care provider on the ambulance and community educators, who are volunteers that focus on community outreach and education, Jacob Burman, the vice president of public relations for EMeRG, said. Burman said EMeRG often receives emergency calls about mental health crises, which can include suicidal ideations, drug overdoses or traumatic life events. Because those scenarios are sensitive, Burman said it is important for responders to be trained on how to handle them. “A really important thing for our providers is to have the resources and knowledge in order to react properly so that they can diffuse the situation and provide them the best care possible,” Burman said. Burman said because it is not always clear how to deal with a patient in a mental health emergency, it is harder to teach responders the right skills. “A lot of times we are taught how to stop the bleeding or taught so many other different skills, but mental health is such an important issue that is often not discussed, so this is something that is especially important to devote time to training and understanding,” Burman said. Mental health has become a top priority for students and officials since four student suicides in 2014. SA presidential candidates Christina Giordano and Erika Feinman both included mental health in their platforms. The group applied to raise funds via Colonial Crowdfunding because they could make money and raise awareness about the new program, Burman said. The University started Colonial Crowdfunding in the fall to help groups raise between $2,000 and $10,000 for a specific cause. Any future donations will go toward more certifications for members and the creation of an instructor course which will allow EMeRG staff to teach future members so mental health first aid can be self-sustainable within the organization, Burman said. Since the certificate is a fairly new program nationwide, GW does not currently pay for it and EMeRG staff have not been trained on the topic previously, Burman said. 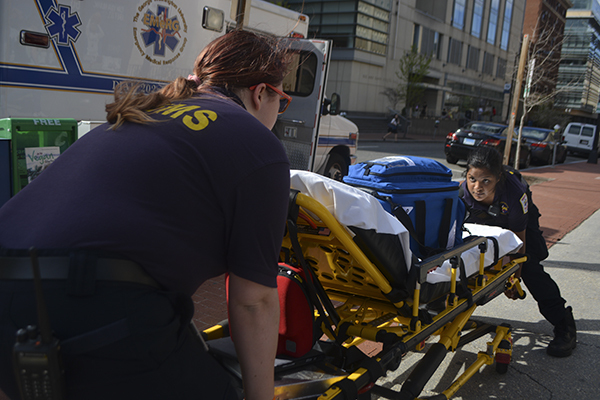 EMeRG provides support to D.C. Fire and EMS in high-volume periods. The group assisted D.C. Fire and EMS after the Washington Navy Yard shooting in 2013 and have helped field emergency calls in high-demand times. “A lot of agencies operate in a manner that is not able to specialize because they deal with so much in such high call volumes, and so I think this is such a great opportunity for EMeRG to be an example of this ability to really dig down and be an exemplary provider,” Burman said. Dean of Student Affairs Peter Konwerski said the training EMeRG is pursuing complements the University’s efforts at Colonial Health, in residence halls and the Center for Student Engagement. “We are grateful EMeRG is prioritizing mental health training,” Konwerski said in an email. Kevin Sullivan, the EMS Coordinator of the GW Police Department, said EMeRG members have pushed to add the new certificate. “We appreciate their motivation and dedication to better serving the community,” he said in an email.